adoro questa rubrica!! molto... ispirante! Love this outfit <3 So stylish and perfect for winters! The fur coat is such a beauty, would love to own one like this! Thanks for sharing these affordable items, really love these kind of posts from you Lilli!!! non mi convince il cappotto, ma il resto del look mi piace molto! It sure is my style! !Like the coat! !So tredy!! Have a happy weekend dear!Filakia!! Bellissima l'aternativa che hai proposto! Dear Lilli, this is a very cool look. Exactly in this arrangement it meets my taste. The Stiefeletten are simply fantastic. 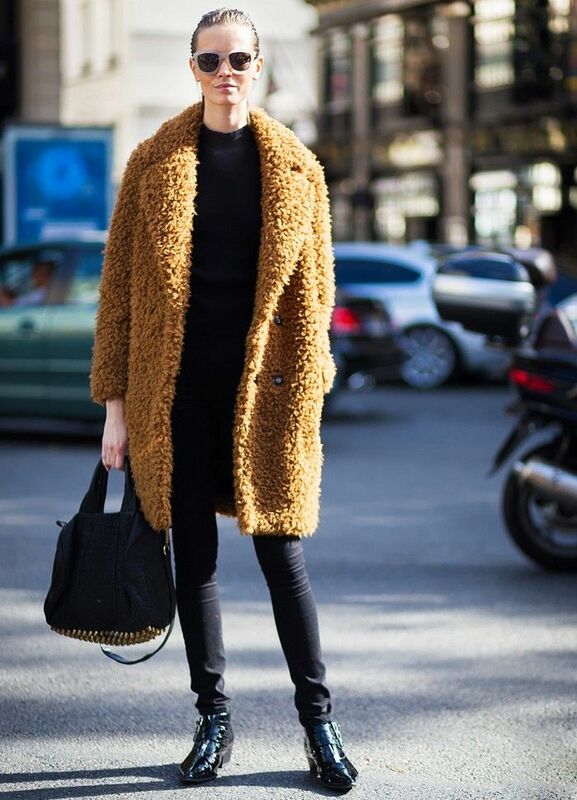 I also like this Teddy coat. Pity that he is sold off. I keep to you the fingers crossed that you find a substitute for a good price. My dear friend Lilli, i send you a big hug an wish a very nice weekend. I agree with you abour faux fur teddy coats. They are indeed irresistible and seem like they would be cozy and soft to wear. I love the one that you found. It just looks so plush and fluffy like it would be a dream to wear and you totally captured the rest of Mina's look as well. Have a wonderful weekend lovely Lilli! Another great post! Happy Friday, Lilli! Thank you for this post, Lilli. I'm a huge fan of bargain option posts because let's face it, I don't have the bank account for all these gorgeous fashion. This is a very good bargain replication of the original look, so thank you again! Un bellissimo look che tu hai ricreato alla perfezione Lilly..
Bella in particolare la borsa. Bellissimo look, il cappotto che hai scelto tu in alternativa lo preferisco!!!!! Allora ci credo che ti piaccia il pellicciotto che ho comprato nei saldi! In effetti questo è un po' meno "peluchoso" del mio ma devo dire che mi piace moltissimo! Bella poi l'idea di indossarlo con un look total black, ci proverò sicuramente anche io!! Baci Lilli!! Un look molto semplice ma di grande effetto, mi piace come lo hai ricreato, il cappotto è troppo bello e anche gli occhiali da sole! mi piace anche il look da copiare in maniera economica, grande!!! I tuoi outfits son sempre mille volte meglio degli originali! Economici e stilosissimi....prenderò spunto di sicuro! Buon week end mia cara!!!! i think those coats are very stylish and cute. love the black underneath Lilli. it makes for a beautiful outfit. wishing you a wonderful weekend. che bella alternativa! un bacio tesoro. Hi Lilli, this outfit looks so stylish, comfy and warm. Our winter this time is super freezing. Less snow but so freezing. This jacket will be perfect to wear in this freezing weather. I'll take the jeans and the pair of boots. Have a wonderful weekend, Lilli. Un bel set, mi piace molto il cappotto! Sei sempre bravissima con i questi post :) IL cappottimo e' bellissimo e poi anche gli stvali... mi pacerebbe molto indossare un outfit cosi! :) Buon weekend cara mia! Hi Lilli. I was just thinking that the coat looks like a teddy bear and then I saw the name. I can imagine having a teddy bear hugging you from the cold. Must be very warm and fuzzy. I hope you find a similar one that is just as affordable. As for your blog turning 3, congrats! I don't have blog anniversary coz I started my blog a loooooooooooooong time ago and didn't bother to remember. Now you make me want to check out when my first post was. I consider you a very sweet and dear blog friend and I'm always thankful for stumbling upon your blog and leaving that first comment. I appreciate our friendship a lot and I love you for being the way you are. Sweet and kind and beautiful inside and out. Hello Lilli. If you were around and have fought for the santa, you would have made our job of choosing a lot easier. Haha... Oh, I feel that you are one of those who would definitely visit and leave some lovely comments. If you feel guilty, I would feel guilty even more. =D I may or may not write about Instagram but if I do, it would be something many Instagram users would love to read... I hope. I really like the coat and the shoes! This teddy coat is absolutely gorgeous and I like these boots. Perfect combination! Lilli good morning! thanks for these recommendations and is giving me ideas for next winter, I usually have a list of things I think investing every season I think the organization is key to all fashion bloggers, of course I have a similar booties! Have a great week hun!